Want to nurture your child’s spatial intelligence? Here are five great activities to do exactly that. In the last post of this series about Dr. Howard Gardner’s Theory of Multiple Intelligences, we learned how to identify the characteristics of the spatial intelligence. Is your child a spatial learner? Are you? Let’s see where the rubber meets the road, and look at some activities you can do at home to strengthen your child’s picture-smarts. For those who are not primarily spatial learners, the five activities below are still awesome and valuable. Remember, regardless of how your child is most inclined to learn, everyone is gifted with all nine intelligences. To improve your family’s spatial intelligence, just incorporate some of these activities into your day! 3-D Art Projects. Pulling from the recycle bin, you and your child can have a lot of fun putting together 3-dimensional projects. You can make castles, robots, dinosaurs, machines, costumes and more. Clay and Play-Doh are other options for 3-D creations. Build. Blocks, Legos, Lincoln Logs and Marble Run are great examples of toys that can strengthen your child’s spatial reasoning and coordination skills. You can also build pillow forts, ice cube castles, marshmallow & toothpick cities – be creative and see what you both come up with! What’s Different? Game. Ask your child to grab a certain number of toys and objects from around the room and put them on the floor. Ask her to arrange them so they are all in view, and have her try to picture what it looks like when she closes her eyes. When she is not looking you can add something, remove something or change where something is placed. Tell her to open her eyes, and see if she can tell you what’s different. (This also helps memory skills). Be sure to take turns! 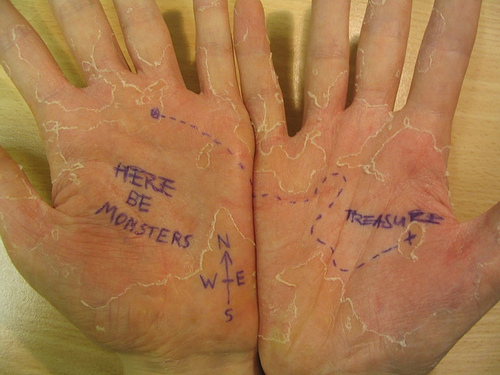 Treasure Maps. Making and following treasure maps will help your child translate a 2-dimensional, birds-eye view of the living room or backyard into the 3-dimensional reality they actually experience. Bury some treasure and gift your pirate a quest! Imagination Journey. Tell your child that you want to take her on a journey through a made-up world. Ask her to get comfortable, close her eyes and relax. Describe a beautiful outdoor scene including sensory information (ie, it smells like roses, you feel the warmth of the sun, you hear a robin singing, etc). In this world, have your child find the most incredible tree. Start asking questions (ie, what does the tree look like? Can you climb it? Is there someone or something already at the top?). Who knows what creatures might show up, or what might happen! When the journey is over, paint or draw different aspects of this imaginary world along with your child. *Parts of this post are taken from The Everything Parent’s Guide to Raising Mindful Children (Adams Media), a book I authored along with partner Jeremy Wardle. Order your copy here! What other activities could families do to cultivate their logical-mathematical intelligence? 5) The Logical-Mathematical Intelligence: What Is A Logic-Smart Learner? 7) What is the Naturalist Intelligence?